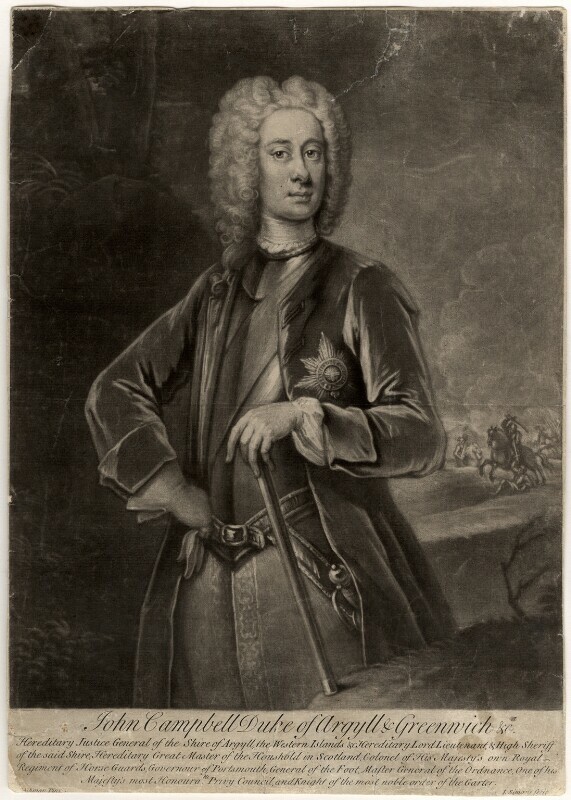 John Campbell, 2nd Duke of Argyll and Greenwich (1680-1743), Field Marshal and statesman. Sitter in 12 portraits. William Aikman (1682-1731), Portrait painter. Artist associated with 29 portraits. John Simon (1675-1751), Mezzotint engraver. Artist associated with 213 portraits. Spanish invasion of Scotland fails. British forces defeat an alliance of Jacobite and Spanish forces led by George Keith, 10th Earl Marischal, amongst others, at the Battle of Glen Shiel. South Sea Company proposes a scheme under which it will buy more than half of Britain's national debt in exchange for trading concessions. Pugilist James Figg claims to be the first English bare-knuckle boxing champion; a title he will hold until the 1730s. Eliza Haywood launches her writing career with the best-selling novel Love in Excess, recounting the amorous escapades of the rake Count D'Elmont. Daniel Defoe publishes his novel Robinson Crusoe. War of the Quadruple Alliance: French army under James FitzJames, 1st Duke of Berwick invades the Basque provinces of Spain but suffers heavy losses due to disease. George Byng, 1st Viscount Torrington assists in the taking of Messina and destroys the remaining Spanish fleet. Prussia conducts Europe's first systematic census. Principality of Liechtenstein is created within the Holy Roman Empire.